The wood cladding is flat at the corners, shiplap-style, but with gaps between the pieces of wood. Moving away from the corners, the wood has been milled so that it appears to swell outward to resemble clapboard, before retreating again to a purely horizontal plane. Each of the 18,000 pieces of Alaskan yellow cedar, cut by a computer-assisted saw, bears a brass tag with a number that identifies it and its particular shape. A stack of the Alaskan yellow cedar, custom milled in Newburyport, Massachusetts, and stained light gray, awaits installation. The shifting orientation of the wood cladding at the intersection of Prescott Street and Broadway creates an interesting change in the way light is reflected at the corners versus the walls. This perspective also affords a view into the winter garden on the Broadway side of the building. Looking out to Broadway from inside the second-story winter garden. Piano is not afraid to expose mechanical construction elements in his work (the iconic example of this is the Centre Pompidou in Paris, which he designed with Richard Rogers), so visitors will be able to see the rack-and-pinion gearing system that allows the winter garden’s exterior wall panel (right) to be moved seasonally. A glass “slot” separating the old Fogg building from the new admits welcome light to the interior. Brick from the old building (96 percent of its materials were ultimately recycled) was used to construct the wall seen here. The centerpiece of the new museum is the fifth-story glass lantern that allows light to flow all the way down to the first-floor courtyard. 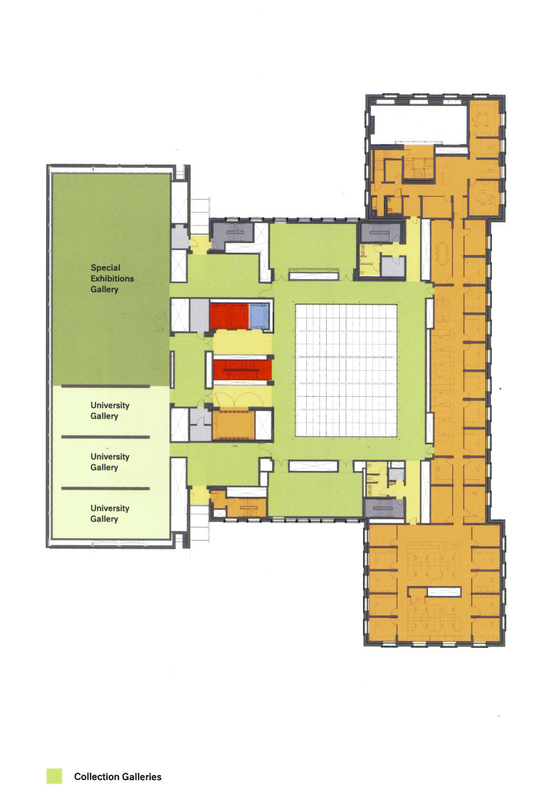 Glass walls in the upper stories of the courtyard afford oblique views into the art study and conservation spaces of this teaching museum, and allow natural light to diffuse through the interior. Cabot director of the Harvard Art Museums Thomas Lentz. Behind him is another example of architect Renzo Piano’s penchant for exposing a building’s systems: the exhaust fans for the atria. A king-post truss system made of delicate-looking steel rods supports the glass roof, or lantern. Piano’s team refers to it as the “light machine,” because shades controlling the amount of natural light that enters through the roof are integral to the building’s mechanical systems. A central staircase, situated in a direct line between the original Quincy Street and new Prescott Street entrances, is flanked by elevators (three for passengers and one for art). Large pieces of modern and contemporary art will likely hang in the double-height spaces of the stairwells. A view above the courtyard from the art-study centers on the fourth floor. These centers, which will allow students, faculty, visiting scholars, and even members of the public to experience works of art at close range, are an integral part of the new building’s academic and strategic goals of critical object-based teaching and learning. The second-floor arcade with its arched ceilings preserves a visual detail from the old Fogg—but in fact the ceilings are all new, the work of local master craftsmen. The floors of the galleries and other spaces throughout the upper stories of the building are walnut-stained oak. This floor is being stained. Gentle barrel vaults in this third-level gallery create the illusion of a higher ceiling, while hiding the ventilation system, in which air enters the room through the narrow slit at the apex of the vault, and returns at the sides of each panel. 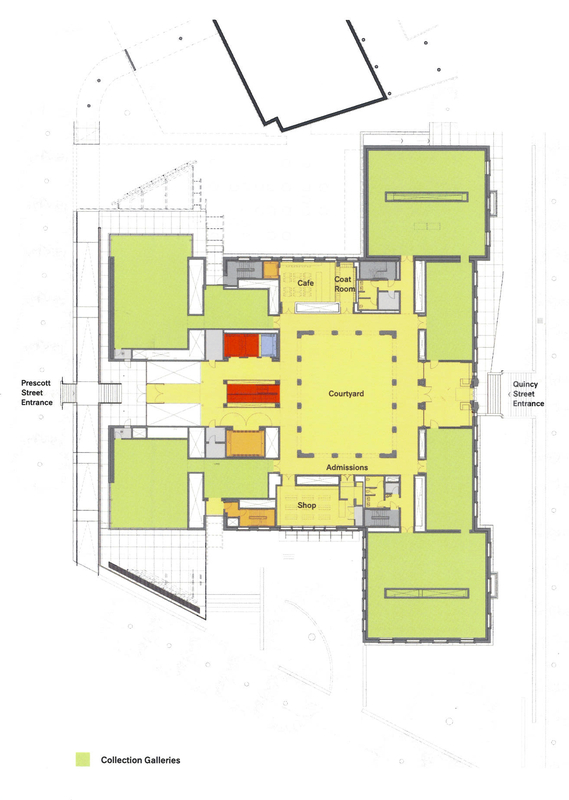 Retaining the human scale of the old Fogg galleries on the second level was an explicit goal of the project. In early September, several reporters were invited to tour the new Harvard Art Museums building that has risen at 32 Quincy Street. The façade of the old Fogg museum still stands facing Sever Quadrangle. But the museum behind it, which is still very much under construction and will not reopen until the fall of 2014, has been reinvented at a cost previously estimated at $350 million. “We are going to unleash the collection, put it to more imaginative uses within the context of a university,” Tom Lentz told his guests, all wearing hard hats and sturdy boots. Lentz, who is Cabot director of the Harvard Art Museums, then proceeded to show off the new building. At the heart of the 204,000-square-foot project is the iconic Fogg courtyard, which has been preserved and enhanced. Where it used to appear that visitors could pass through the courtyard’s many archways (in fact, there were just three entrances), now the space functions as a true center, with 16 ways to enter and exit it on the first level. Natural light streams in from a glass roof above the fifth level, diffusing into the galleries and arcades, while the visitor’s eye is naturally drawn up to the additional galleries and working spaces of the museum’s upper stories. Instead of a single main entrance to the museum, there are now two: the old one on Quincy Street; and a new, more welcoming one on the Prescott Street side, as Lentz explained. The entrances are aligned, allowing visitors to pass through what will now be public space, including the courtyard with its travertine arches, without having to enter the galleries (which requires an admission fee). 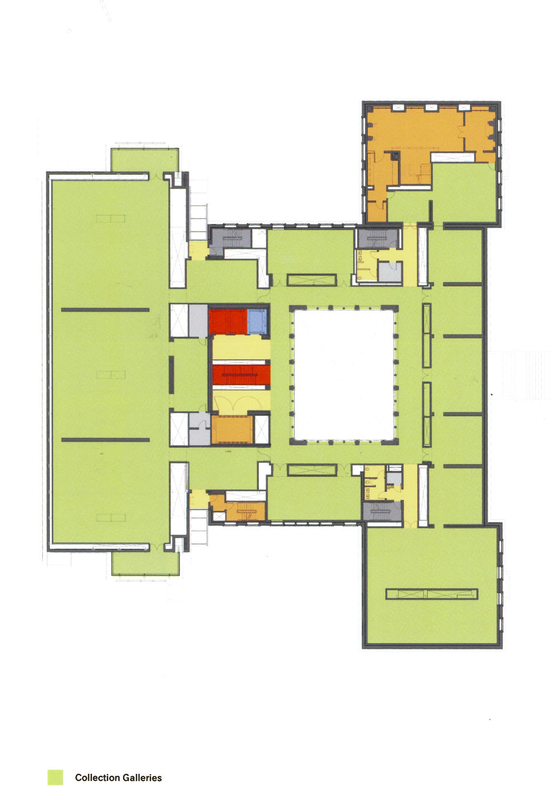 A café and a museum shop will flank the courtyard, and a central staircase between the two entrances is flanked by elevators, three for passengers, and one for transporting works of art from the 8,000-square-foot on-site storage facility to the conservation lab on the fifth level and the art study centers on the fourth. Major mechanical systems have been located just above bedrock on the building’s lowest levels in order to maximize use of the site. 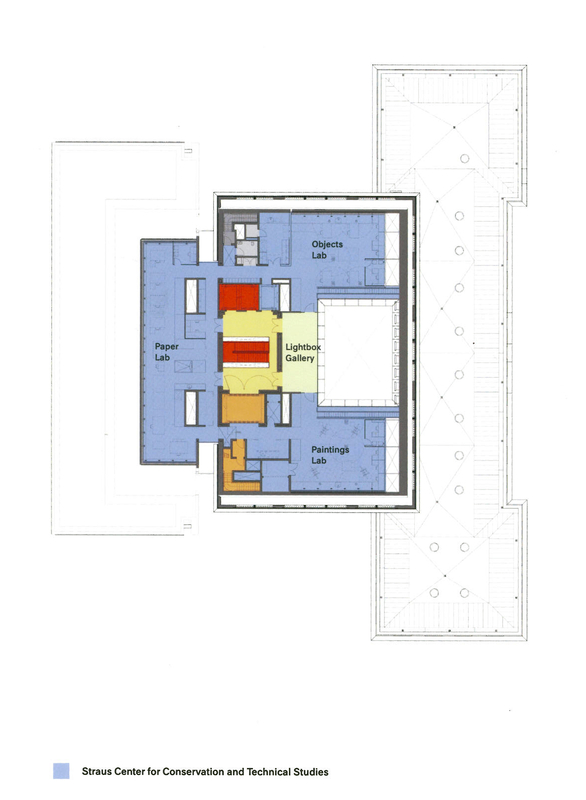 Among the new building’s most important mission-driven features are the reinstalled Straus Center for Conservation and Technical Studies (which will include separate lab spaces for paper, paintings, and objects) and the art-study centers on the fourth level, one for each of the constituent museums (the Fogg, the Busch-Reisinger, and the Sackler) that are now joined under one roof. The study centers will allow “an experience that is fundamentally different from walking through galleries or sitting in a classroom,” said Lentz. 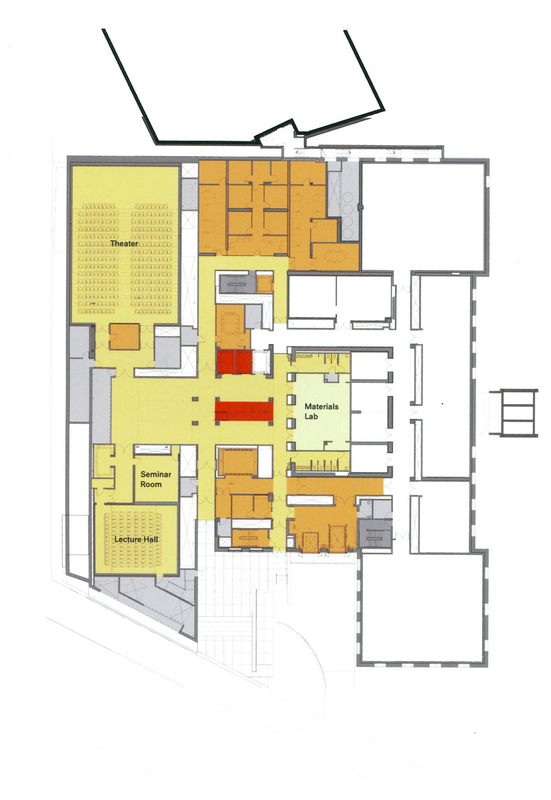 The building’s lower level offers a new 300-seat theater, a 100-seat lecture hall, and a 30-seat seminar room. 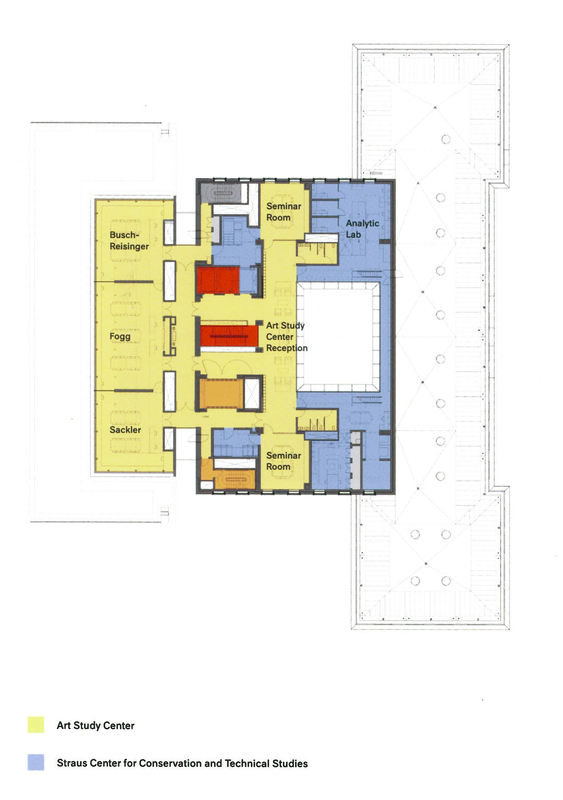 On the first, second, and third levels, the new building adds more than 12,000 square feet of new gallery space—bringing the total to 43,000 square feet—some designed specifically for instructional use. Professors will curate the collections exhibited in these small galleries in association with courses. The third-level galleries also feature a new University Collections space that will initially house African art from the Peabody Museum. “One of the things we are trying to do,” said Lentz, “is forge much stronger relations with other collection resources at Harvard, the Peabody in particular. This is important to us because it is an enormous and very important collection that dovetails neatly with our gaps. Historically, we have never collected pre-Columbian, African, Native American, or Oceanic art. The good news is Harvard has very powerful collections [in these areas] at the Peabody.” The new building will become, in a sense, “a portal for those collections.” “And,” he added, “an engine for collaboration across different fields and disciplines” throughout the University.